Summary: Twenty poems by African American authors are paired with twenty art selections by African American artists. The book includes biographical information about each writer and artist in a section at the end. Literary elements at work in Story: A wide variety of styles—visual and literary—makes for a diverse and interesting collection. Emphasis on literary and artistic diversity carries over to larger implications since celebration of diversity is a major theme. How does the perspective on gender/race/culture/economics/ability make a difference to the story? : The book is a celebration of African American culture, history and identity. The title of the book, “Words with Wings” reminds us that poetry and art not only express an author’s experience but also inspire a reader’s creativity. Theological conversation partners: Poetry and art are gifts that help us depict, express, and share human experience. Since this book focuses on African American experience and identity, it might be interesting to point out to children that the Psalms is a collection of poems/prayers/songs similarly expressing the experiences, hopes, celebrations, and grief of a particular group of people, the Israelites. Such a discussion could move to how poetry, art and the Psalms also apply beyond one group to be relevant expressions for all. Which poem do you like the best? Did any of the poems make you angry? Sad? Happy? Choose a favorite picture. Why do you like it? Try writing your own poem and drawing a picture to illustrate it. Look in the book of Psalms and find a Psalm that goes along with one of the pictures. This review is written by Union Presbyterian Seminary alumna and staff member Anne Rankowitz. 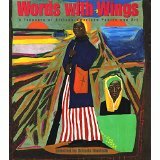 Words with Wings: A Treasury of African American Poetry and Art by Storypath is licensed under a Creative Commons Attribution-NonCommercial 4.0 International License.